OWN IT's Philanthropy team was established several years ago in an effort to integrate the act of giving into OWN IT’s core mission and to uphold our commitment to effecting positive social change. The same spirit that inspires the OWN IT summit drives OWN IT’s philanthropic initiatives – a spirit of inclusivity, support, and feminism. This spirit manifests itself in our philanthropy through the ways in which we provide advice to a younger generation of those who identify as female, offer financial aid to organizations that support women of all kinds, and draw attention to the needs and concerns of female-identifying individuals both within and outside the Georgetown community. Ultimately, OWN IT recognizes that we have a responsibility not only to highlight female voices, but also to support women in their everyday lives. 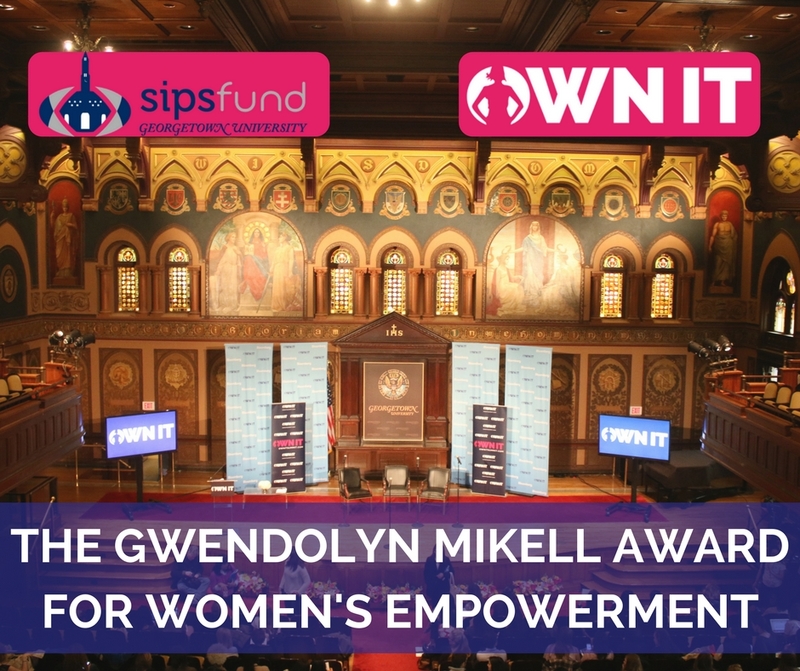 The Gwendolyn Mikell Award for Women's Empowerment was conceived as a collaborative effort between the SIPS Fund and Georgetown University’s OWN IT Summit to address the inequities and barriers to success that women face by institutionalizing support for an undergraduate student or alumni non-profit project that facilitates the advancement of women. WHAT IS AN IDEAL PROJECT? For more information on these criteria, please see SIPS Fund rubric here: http://sips.georgetown.edu/eligibility/. Note: we will only award a project that is far along in development and falls into the "Above Average" or "Exceptional" categories on the rubric. Attend all mandated workshops through the Center for Social Justice. The obligatory workshops are project dependent. Example include Protection of Minors Training, International Health & Safety Training, etc. The SIPS Fund will advise you on the relevant trainings. Participate in a one-day workshop with our partners at McKinsey & Co. which will focus on problem solving and impact evaluation. Date TBA. Write blog/record vlog posts for the SIPS and OWN IT websites throughout the lead-up, execution, and post-implementation stages of your project. Our Operations Director and Communications team are here to help you show the world how you took your project from idea to reality! Document your project. Suggestions include taking photos or videos in the field, conducting interviews with community members, or creating visualizations of your data if applicable. Submit 1-2 page project updates to brief the OWN IT Board and SIPS Executive Committee and Board of Trustees on your progress, which will be solicited periodically. Attend the Georgetown University OWN IT Summit on March 24, 2018, to present your work to attendees as well as to obtain feedback on your project from speakers.